Every evening when I walk into my office, I walk past this window that looks out over the gazebo thing in my garden. And of course I take a peek on my way to the computer to see what's blooming, how many weeds have grown since yesterday, how much of a raggedy mess the lawn is, that sort of thing. Sometimes I'm so compelled by what I see, I have to get my camera and go try to get a few pictures before the sun goes down. Tonight was definitely one of those nights. What an explosion of flowers! I mean, I knew they were blooming, I walk past that window every day. But I hadn't really realized just how much they were blooming. It kind of just stopped me in my tracks. When we moved here, that corner was a chemically stripped barren wasteland, and it seemed like it would never be pretty. So it still kind of surprises me when I notice that it is. Of course, I had to sit in my chairs there and enjoy being surrounded by flowers. On the fence behind the gazebo thing I have a New Dawn climbing rose. It's just starting to bloom now, and the blooms smell fantastic. I can't wait until the clematis joins in, there's just loads of buds on it. 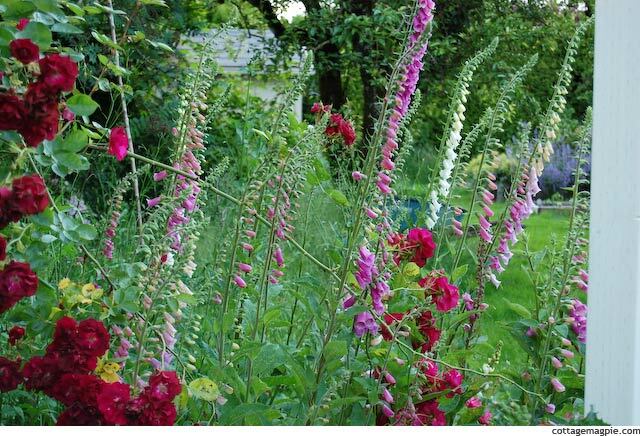 I never thought all the shades of pink would make me so happy, with the different roses and foxgloves, but they do. Coming down the path from the gate it's a shaggy, lush mess of flowers. I like it, shag and all. But if you turn a bit to the left, you can see that the next wave is already coming. See the bit of orange? New colors are coming, you can see them starting to show! Right now, the weather is still cool and lovely, and all the pinks and blues are so pretty. But very soon the son will be hot and bright, and the pink would seem washed out. 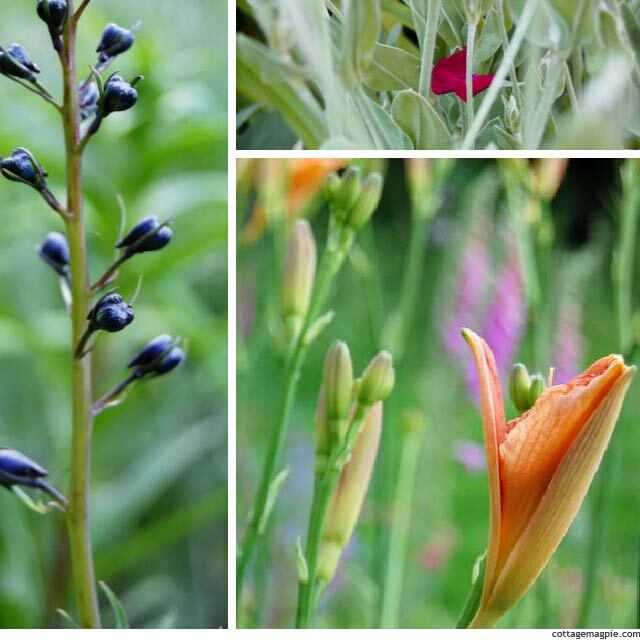 Right about then, the brighter colors take over, and the garden becomes a bright, cheerful riot of color. I like that, too. 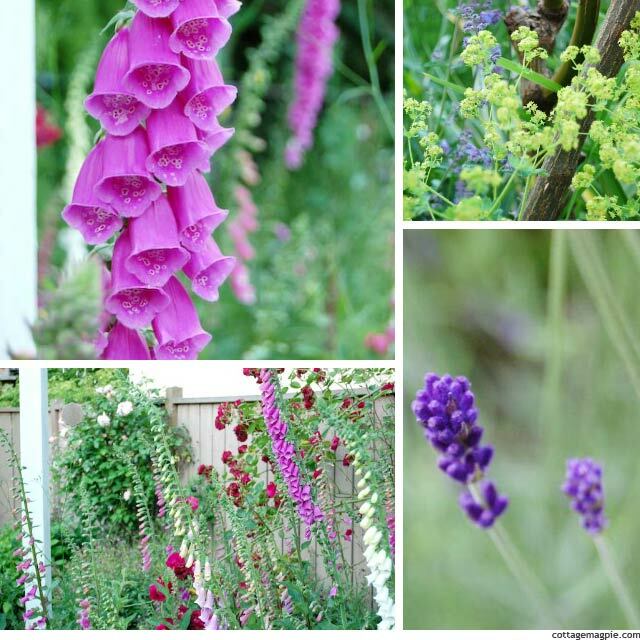 Linking up to: Garden Blogger's Bloom Day, June 2102 and Tuesday Garden Party at An Oregon Cottage.